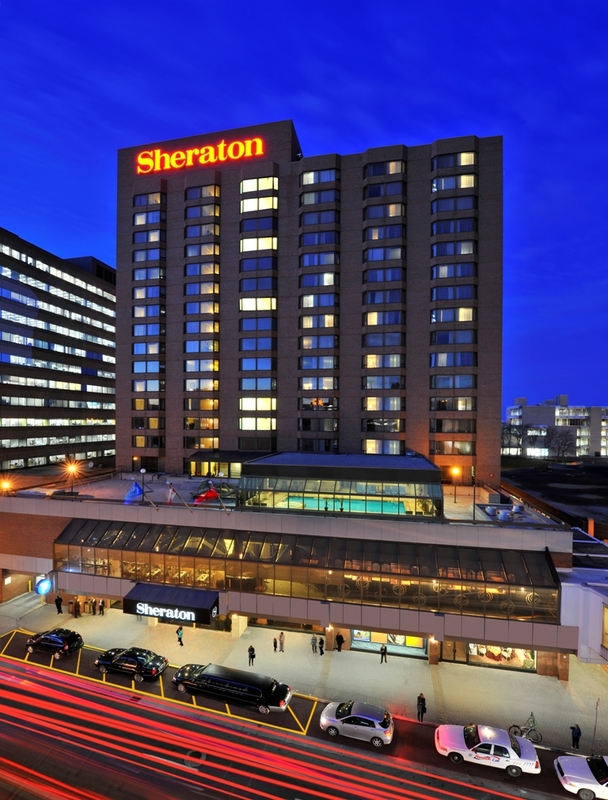 Welcome to Sheraton Hamilton in the heart of the city! As Hamilton’s leading full service hotel, we are ready to welcome you and your guests with warm smiles and reassuring service. 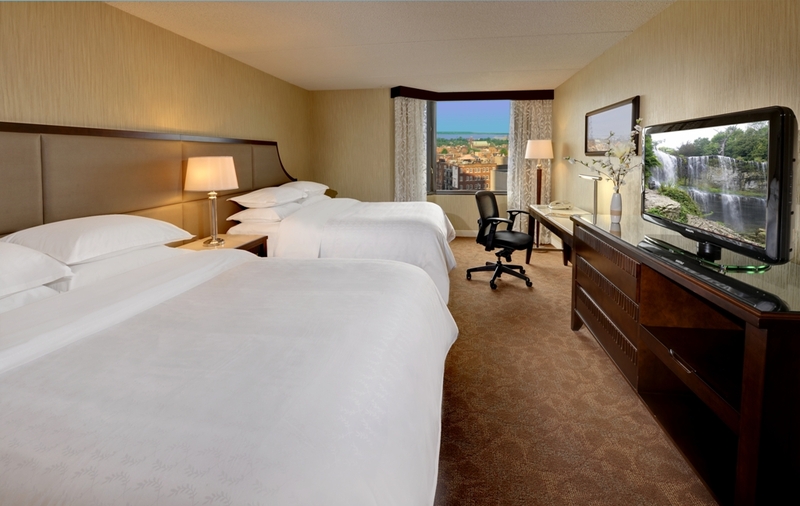 Our 301 room hotel tower offers a variety of accommodations to suit your needs. Enjoy beautiful views of Lake Ontario, surrounded by historic Hamilton. Only steps away you can explore terrific shopping, dining and entertainment, or do business in the city’s premier convention venues. With onsite restaurants, internet lounge, indoor pool, whirlpool and fitness centre, Sheraton Hamilton offers guests the ideal space to connect with friends and colleagues, rest, relax and unwind. Whether you are looking to bring a large group of people together or reconnect with family and friends, our dedicated staff are ready to help create a memorable event. From our Grand Ballroom to our intimate meeting rooms, flexible event spaces make it easy to connect, share ideas and form lasting bonds. We look forward to the opportunity to welcome guests to Hamilton and the hotel. 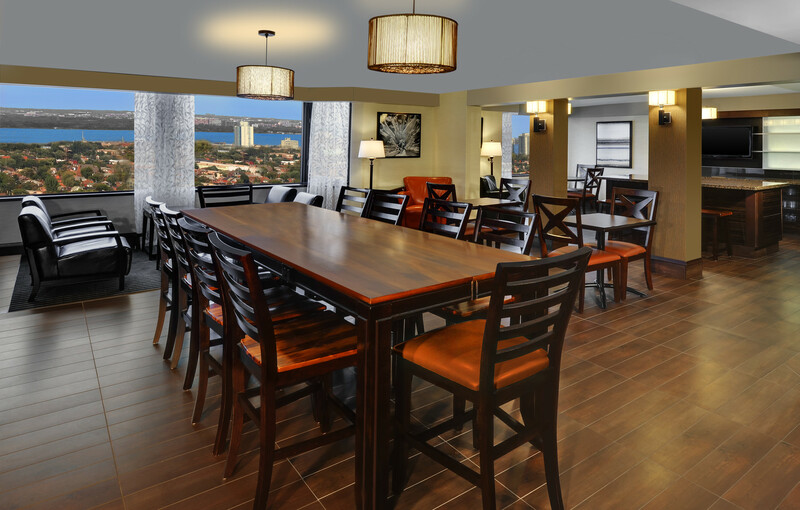 We are pleased to offer a variety of accommodations to suit your needs! Our comfortably appointed guestrooms are designed with visitors in mind and provide a welcoming space to rest and relax away from home. Guests will benefit from a rejuvenating night’s rest in our signature Sheraton Sweet SleeperTM beds, plush duvets and crisp white linens, standard in all 301 of our guestrooms. 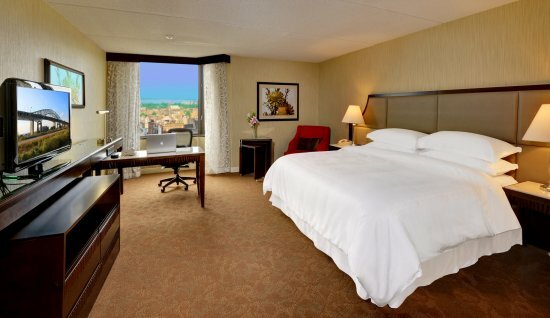 Room types include; our Traditional single King and double Queen guestrooms, Deluxe King Corner guestrooms (spacious corner rooms, include mini fridge), Club Level accommodations and 4 suites for your enjoyment. Our Club Level guestrooms feature upgraded amenities, complimentary wireless internet and 24 hour access to our 17th floor Club Lounge with daily breakfast and evening hors d’oeuvres. Club Level guests also enjoy complimentary beverages and snacks in the lounge, including espresso, coffee and fresh fruit. At Sheraton we understand the importance of finding time to relax and unwind. Our heated indoor pool and whirlpool allow guests to escape and recharge after a day of meetings or sightseeing. With state of the art fitness equipment our Sheraton Core Fitness Centre means guests won’t skip a beat in their workout routine! There are a number of beautiful natural locales for guests who prefer to exercise in the great outdoors. Located within minutes from the hotel, the Hamilton Harbour Waterfront Trail offers 4.2km of scenic space, ideal for a jog, long walk or simply relaxing outdoors. Guests can connect directly with the front desk to organize a day of golf, rock climbing, sightseeing or local shopping! 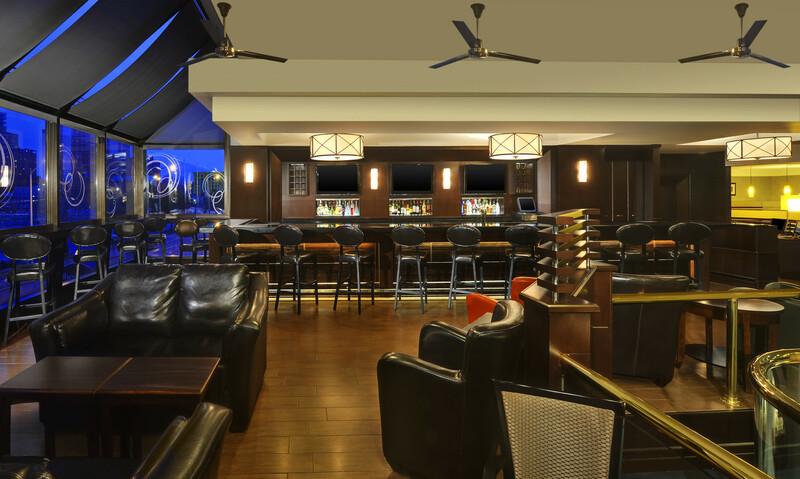 At the Sheraton Hamilton we have specially designed our 2nd level to cater to our guests! Here guests can connect to home or the office in our internet lounge- the Link@Sheraton experienced with Microsoft while enjoying a quick bite to eat between sightseeing or meetings. Floor to ceiling windows and plush leather seating invite guests to unwind with a cocktail in our LOFT Lounge. This spacious, open concept lounge overlooks the hotel lobby and grand staircase and is the ideal space to meet before a busy day of meetings or a night on the town. Chagall’s Restaurant has been streamlined into an intimate dining area and features delicious menu selections from our onsite Chef. 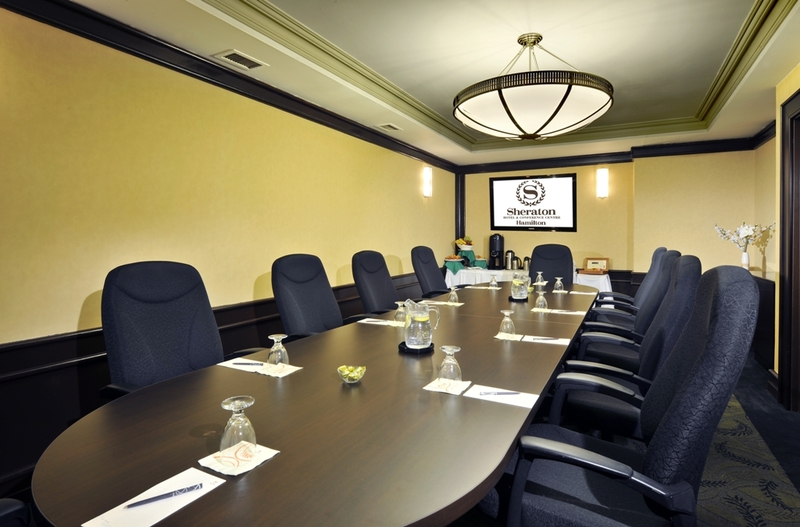 With 17,000 square feet of meeting and event space, the Sheraton Hamilton is the ideal solution for small gatherings of 10 guests up to intricate conferences of up to 400. Modern spaces provide the perfect backdrop for successful and productive meetings, while our in-house catering offers delicious menus for formal, black tie events or simple working lunches. Our team is here to guide you through the planning process, facilitating audio-visual service, team building events or group entertainment, and tailoring specially catered menus to suit your groups’ unique needs. Our convenient location provides indoor connection to the Hamilton Convention Centre and is only one short block from Copps Coliseum!